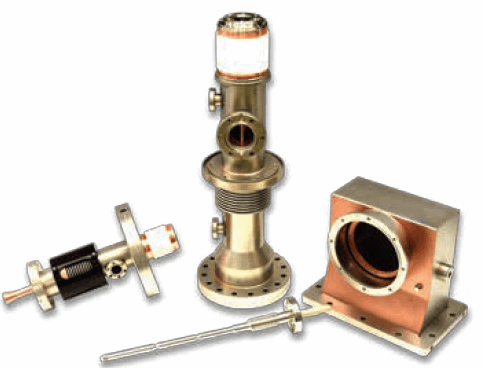 CPI manufactures a range of power coupler products to meet customer specifications with available power ranges from 5 kW to 1 MW and frequencies ranging from 175 MHz to 3.9 GHz. These power couplers are ideal for applications utilizing superconducting accelerators, free electron laser injectors, spallation neutron sources, energy recovery LINACs, X-Ray free electron lasers, and third harmonic cavities. CPI has developed the capability of plating high-RRR copper on stainless steel and applying titanium nitride (TiN) coatings to ceramic windows for these couplers. CPI is currently manufacturing 300 power couplers for XEFL and LCLS-II accelerators with the necessary infrastructures for fabrication and assembly rates. For more information on the available power couplers from CPI, download the brochure.